Eileen Fisher is the Founder and Chairwoman of EILEEN FISHER, INC., the clothing company known for its simple shapes and beautiful fabrics. Eileen ventured into clothing design in 1984. Her original concept - pieces that work together to help women get dressed easily - still defines the company's collections, which are sold at 65 EILEEN FISHER stores, over 300 department and specialty stores across the US, UK and Canada as well as 2 Green Eileen stores, which are part of the company's innovative recycling program. In February 2016, EILEEN FISHER, Inc. became the largest women's fashion company to be certified a B Corporation by B Lab. In addition, the company is the largest B Corp in the state of New York. Eileen is passionate about business as a movement. In spring 2015, the company announced VISION2020, a bold five-year plan that addresses sustainability and human rights. In keeping with Eileen's belief in collaboration, VISION2020 calls for partnering with other brands to shift the fashion industry. "We don't want sustainability to be our edge," says Eileen. "We want it to be universal." In 2015, Eileen also launched the Eileen Fisher Learning Lab where employees and the public are invited to embark on journeys of inquiry to explore purpose, mindfulness and embodiment through a variety of workshops and events. In October 2015, the Fashion Group International honored Eileen with the prestigious Sustainability Award. Eileen was the recipient of the 2015 Riverkeeper Award as well as BF+DA's Corporate Leadership in Advancing Sustainability Award. Eileen's additional honors include the 2012 Leaders of Change award from the Global Conference for Social Change and the Board of Directors Award from the Metropolitan New York Chapter of the US National Committee for UN Women. She is a 2012 inductee into the Social Venture Network Hall of Fame and a member of the Clinton Global Initiative. I think my experience as a young mother in the early years of the company had a direct influence on my commitment to support the health and well-being of our employees and their families. When I was raising my two kids, I felt pulled between the demands of my work life and my personal life, almost as though they were at odds with each other. Honestly, I was often overwhelmed. We try to support our employees with wellness and education programs, personal growth opportunities and flexible work arrangements. I think we build stronger relationships within companies - and we do better work - when our employees are growing as people and when they feel cared for and are encouraged to pause and take time for themselves. I'm a listener by nature (I was terribly shy as a child and I come from a large family) and I felt most comfortable being in the role of listener and observer. From the early days of the company, the way that I connected and tuned in was to ask questions, to get the right people in the conversation and make sure every voice was heard. The company was founded on the idea of collaboration. It's the way we've always worked. 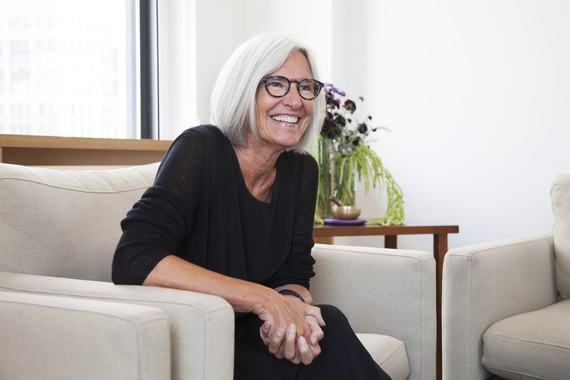 What have the highlights and challenges been during your tenure at EILEEN FISHER? I believe that within any problem is the secret to your next great success. Highlights and challenges are often closely connected. Looking back on our 30+ years as a company, I think we've really advanced within the sustainability conversation. It's been an evolution and we continue to move towards our own sustainability goals. But we're up against a huge challenge in the fashion industry. Not everyone knows - and maybe some don't want to admit - that the fashion industry is one of the largest polluters in the world, right up there with oil. It's a massive problem, and we're in the midst of it. I feel passionate and purposeful about the need for significant change - and I'm committed to raising my voice and partnering with other leaders to pool our collective talent and resources to shift our course. The vastness of the digital landscape is another challenge we face every day. We're trying to understand the pace and impact of the technology. How do we fully convey the story of our company and product? How do we continue to build relationships with our wonderful customers? What does it all mean in the digital, 3D, ever-changing world? Big questions. Big challenges. Another challenge and opportunity comes out of our consistent growth. We do our best to include as many voices as possible in our meetings and conversations. The best idea may not necessarily come from the top, but from anyone at any level. The collaborative process can get pretty chaotic and confusing as our numbers increase - we now have over 1,200 employees. Fortunately, we do have a few key people making the decisions - otherwise, nothing would ever get done! But the process, for all of its complexity, produces a lot of energy. And that's where creativity and innovation have the chance to emerge. I'd say find support (there will always be stumbling blocks) and listen closely to others, but always come back to your own reflections and intuition about what is right. Stay true to what matters to you. And keep going. One of my biggest challenges has been finding my voice and gaining the confidence to speak up. I've learned over time that I actually have a lot to say, but that's been a process for me. Particularly around issues like sustainability and business as a movement, I've learned that my voice has power and can be a force for good. Before I started the company, I could see the clothes as pictures in my mind. I followed that vision and felt my way into the work. There is something very powerful about that inner vision. Getting in touch with what matters most to me and having a sense of purpose gives me energy and confidence to take the next step and move forward. I also believe in the importance of "showing up" and being present - that's something I work on every day. Work/life balance is something that's probably been the hardest thing I struggled with, and I still struggle with it. I try to make my personal life a priority, and model that for others. In the company, we try to pay attention to one another, to be mindful of the way we treat each other. We recognize that we're all human, we're trying to live our lives. Feeling supported and understood at work can help move us toward more balance in life. I think it's still a challenge for women to find some balance between their lives in and out of the workplace. I didn't really have a mentor as a young designer or when I started my company. I resourced myself, and I built a great support system and surrounded myself with people who encouraged me. Hillary Clinton. For her confidence and courage. What do you want EILEEN FISHER to accomplish in the next year? We grow clothes, we grow people and we grow business for good - that's our company purpose statement. In the year ahead and for years beyond, we'll continue to produce beautiful, sustainable clothes. We'll support our people to figure out what matters most to them, so they can build on their passions and make a difference in their work and in their lives. Business that is driven by purpose and sustainable practices can be good for the world. We're on a learning journey and we're building toward that vision.